Ulmus americana L. Sp. PI. 226. 1753. A large tree, with gray flaky bark, and glabrous or sparingly pubescent twigs and buds; maximum height about 1200, and trunk diameter 11°; the branches not corky-winged, terete. Leaves oval or obovate, apex abruptly acuminate, base obtuse or obtusish, and very inequilateral, sharply and usually doubly serrate, smooth or rough above, pubescent or becoming glabrous beneath, 2'-5' long, 1 1/2'-3' wide; flowers fascicled; pedicels filiform, drooping, jointed; calyx 7-9-lobed, oblique, its lobes oblong, rounded; samara ovate-oval, reticulate-veined, s"-6" long, its faces glabrous, its margins densely ciliate; styles strongly incurved. In moist soil, especially along streams, Newfoundland to Manitoba, Florida and Texas. Wood hard, strong, close-grained, compact, dark brown; weight per cubic foot 40.5 lbs. March-April. Samaras ripe in May. The species consists of many slightly differing races. Swamp-or rock-elm. Ulmus racemosa Thomas, Am. Journ. Sci. 19: 170. 1831. Not Borckh. Ulmus Thomasi Sargent, Silva 14: 102. 1902. 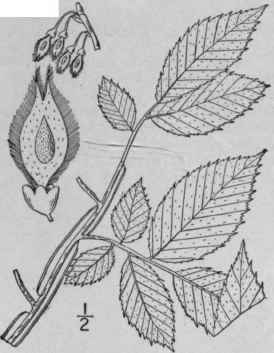 A large tree, attaining a maximum height of about 100° and a trunk diameter of 4°, the young twigs puberulent; bud-scales ciliate and somewhat pubescent; branches, or some of them, winged by narrow plates of cork. Leaves similar to the preceding, but less sharply serrate, smooth above; flowers racemose; pedicels filiform, drooping, jointed; calyx-lobes oblong, rounded; samara oval, 6"-8" long, its faces pubescent or puberulent, its margins densely ciliate; persistent styles strongly incurved and overlapping. In rich soil, Quebec to Ontario, Minnesota, Kentucky, Missouri and Nebraska. Wood hard, strong, tough, compact; color light reddish-brown; weight per cubic foot 45 lbs. April. Called also Cliff-, hickory- or swamp-elm. Racemed or corky white-elm. Wahoo. Ulmus campestris L.. from Europe, distinguished by its nearly sessile flowers, nearly or quite glabrous, not ciliate samaras, and wingless branches, rarely escapes from cultivation. Ulmus alata Michx. Fl. Bor. Am. 1: 173. 1803. A small tree, sometimes 500 high and with a trunk diameter of 2 1/2°; the branches, or most of them, with corky wing-like ridges. Twigs and buds glabrous or nearly so; leaves oblong, oblong-lanceolate or oblong-ovate, acute, doubly serrate, base obtuse, inequilateral and sometimes subcordate, roughish above, pubescent beneath, at least on the veins, 1'-3' long, 1/2-1 1/4' wide, the veins ascending, some of them commonly forked; flowers fascicled; pedicels filiform; calyx-lobes obovate, rounded; samara oblong, 4"-5" long, pubescent on the faces, the margins densely ciliate; styles very slender. In dry or moist soil, southern Virginia to Florida, west to southern Illinois, Missouri and Texas. Wood hard, weak, compact; color brown; weight per cubic foot 47 lbs. March. Water-, cork- or witch-elm. Ulmus pubescens Walt. Fl. Car. 111. 1788.? Ulmus fulva Michx. Fl. Bor. Am. 1: 172. 1803. 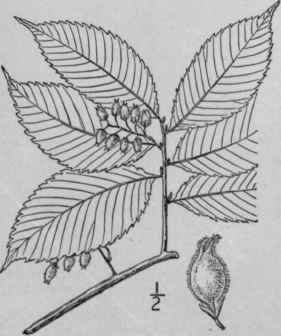 A tree, with rough gray fragrant bark, maximum height about 70°, and trunk diameter 2 1/2°; twigs rough-pubescent; branches not corky-winged; bud-scales densely brown-tomentose. Leaves ovate, oval or obovate, very rough with short papillae above, pubescent beneath, sharply doubly serrate, acuminate at the apex, obtuse, inequilateral and commonly cordate at the base, 4'-8' long, 2'-2 1/2' wide; flowers fascicled; pedicels 2"-3" long, spreading, jointed near the base; calyx-lobes lanceolate, subacute; samara oval-orbicular, 6"-9" long, pubescent over the seed, otherwise glabrous, the margins not ciliate, retuse. In woods, on hills and along streams, Quebec to North Dakota, Florida and Texas. Wood hard, strong, compact, durable; color dark reddish-brown; weight per cubic foot 43 lbs. Foliage and mucilaginous inner bark very fragrant in drying. March-April. 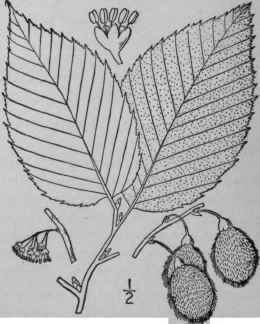 Indian or sweet elm. 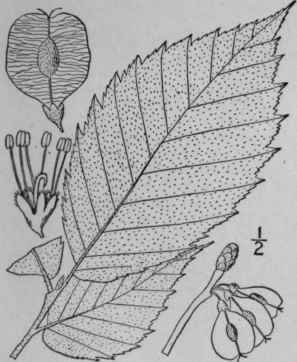 Rock-elm. Ulmus serotina Sargent, Bot. Gaz. 27: 92. 1899. A tree, reaching a maximum height of about 500 with a trunk diameter up to 30, the bark thin, shallowly fissured, light brown, the young twigs smooth or nearly so. Leaves ovate to obovate, acuminate, 2'-4' long, pubescent on the veins beneath, rather coarsely serrate, firm in texture but thin; flowers in short racemes in the axils of leaves of the season; calyx-lobes spatulate; samara oblong to elliptic, stalked, 5 "-6" long, fringed with long white hairs. Banks and bluffs, Kentucky to Georgia and Alabama. Autumn.